Excellent natural ground-durability is a key feature of the NZDFI Top 5 species selected for genetic improvement. The NZDFI Top 5 selected species are all in Class 1 or 2 based on the Australian Durability Standard. Natural durability is defined as “the inherent resistance of a specific timber to decay and to insect attack”. Natural Durability Classes provide the basis for rating the timber’s performance and longevity in contact with the ground when exposed to average environmental conditions. 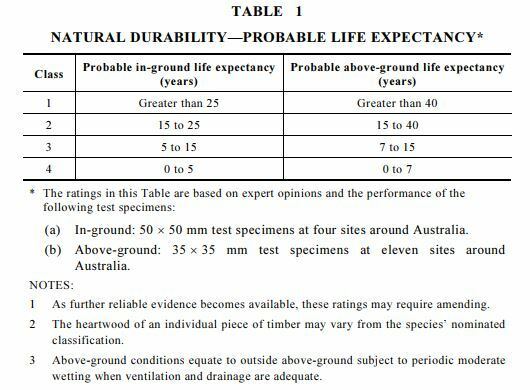 The classification system is based on the average life expectancy (in years) for any timber species, as shown below. The classifications only apply to heartwood; all sapwood has poor resistance to decay and insect attack. The inner core of heartwood around the pith generally has lower durability than the rest of the heartwood. Durability is also influenced by the size or diameter of the post: the larger the piece size the longer it will last. The age of the tree from which timber is cut also generally influences natural durability. Mature trees generally produce more durable timber than semi-mature trees.